This very beautiful monkey is fairly large in size and so distinctive in its marking that it is easily recognizable. The jet black of the head, back, limbs, underpants, and upper portion of the tail contrasts sharply with the long flowing cloak of silky white hair which hangs down on either flank, the large tuft of similar white hair on the tail, and the white beard framing the black face. 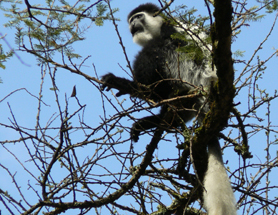 The sexes are alike in appearance, Colobus dwell in forest and are often found in the belts of tall trees along river banks. Feeding on the leaves of trees, and very seldom descending to the ground, they do not cause damage to crops - as do some other monkeys - and are completely harmless to man. Usually seen in troops of a dozen or more, when disturbed they race with great agility along branches high above the ground, making prodigious leaps form tree to tree and occasionally pausing to peer down at the intruder form the shelter of the forest canopy. Their call is a hoarse, almost frog-like, croak, usually made in unison by several members of a troop, and often heard in the early mornings as first one troop calls and then another answers. Though still fairly widely distributed in Ethiopia, and fully protected by law, these most attractive creatures are unfortunately heavily hunted for their skins which are used to make rugs and carosses.